This latest CD from L.A. Guns has been out for several months now. Honestly, I didn't even plan to review it when I picked it up a couple weeks ago simply because it has been out so long.. 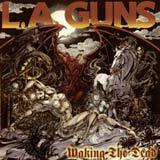 However, I read online that Tracii Guns was not happy with the response to this album and may very well call it quits. That's a shame because this album is excellent album, ranking right up there with the first two albums from this band. After a tumultuous period for the band which saw numerous lineup and musical changes, it's great to hear L.A. Guns come full circle. Too bad no one seems to notice. I won't go as far as to say that this is the band's best work, but it is clearly their best album since Cocked and Loaded. I wasn't completely sold on Man In The Moon, which is the band's "reunion" album of 2000. That album sounded somewhat akward to me. I got the impression that the band forced themselves to get along together to make an album. However, Waking the Dead comes across just the opposite. This time around, the guys sound like they had a genuine fun time making this album. As a result, this album is extraordinarily fun to listen to. Phil Lewis lays down a career performance behind the mic as far as I'm concerned. It's amazing how this guy has retained his full range and intensity over the years. He sings with the same enthusiasm that help make the band's earlier works such head banging favorites. The heavy title track showcases exactly how Lewis' voice has remained in tact over the years with the low growls and high shrieks pulled off with ease. Tracii lays down some heavy and catchy (sometimes downright vicious) throughout the album. After listening to some earlier work by Tracii Guns, it is evident that his guitar playing has improved significantly over the years. Furthermore, the bass guitar is much more well balanced in this album when compared to much of the catalogue. This ceratinly makes for a more meaty sound overall. There are only a couple of tracks that don't match up to the rest of the album. The Ballad, as the name indicates, is a very standard rock ballad. Tracii and Phil have their moments in this cut, but at the end of the day, it's just another "heard it before" ballad that doesn't stand out. Frequency is the other average track of the album. Not bad per se, but it just doesn't stack up well against the rest of the album which consists of some truly outstanding songs that will jump on you like glue upon the first spin of the cd. Most "sleaze" rock / metal bands from the L.A. scene of the late 80's called it quits long ago, or completely changed their style (Faster Pussycat and Love/Hate to name a couple). With Waking the Dead, L.A. Guns have pulled a classic sleaze rock / metal gem out of their pocket that will certainly please fans of this genre who don't hear all that much new material of the sleaze metal genre these days. As I said, some of you may have already heard this album as it has been out for quite a while now. However, this album exploded all expectations I had prior to listening to it (and thus the "surprise of the month" skeleton). Since this fine album has gone largely unnoticed by the joke called the "music industry" here in North America. I thought it would be nice for me to shine the spotlight on Waking The Dead this week. After all, when a big name band <cough, cough, Metallica> can sell total crap to the masses based on name alone, I like to take the opportunity to expose a largely untoiced, quality album to those who may have missed it. L.A. Guns has found the enthusiasm and spirit they had as an emerging force on the scene some 15 years ago, without sounding dated. Also, the production is actually very good (especially when compared to their releases of the 90's). If this is in fact the farewell album of the band, they will go out on a very positive note. Let's just hope there is more to come.